1914. Jean Mordant is winning the title of World Wrestling Champion. Back home in Ostend, Belgium, his daughter Mimi is brutally raped by German soldiers. Jean swears to avenge her and enrolls in the prestigious ACM, the first ever armored car division. Little does he know he is embarking on an epic voyage that will drag him around the earth. An incredible journey that will reshape his world forever. Jan Bultheel worked for 16 years directing and producing mainly commercials in his own production company ‘Pix & Motion’, which brought him international recognition with numerous awards. In the new millennium Jan left advertising to concentrate on creative work for theater and dance companies and authored, designed and directed ‘Hareport’, an animated series for children produced by TF1 and Ketnet and sold to several European channels. 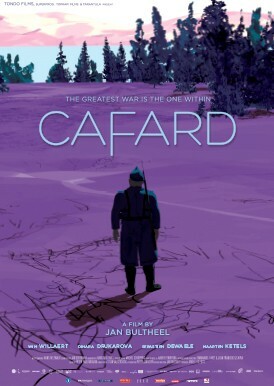 Cafard is his first animated feature film. Cafard is completely author driven. Jan wrote the script, designed the graphic style, directed the actors, edited and staged the scenes, guided the animation team and he even textured all the models and sets himself !